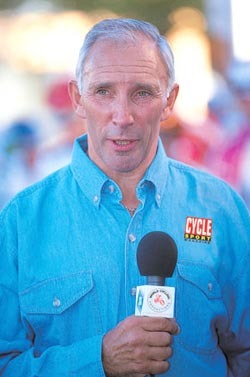 Professional cycling's most renown and respected race commentator and reporter, Phil Liggett, will be a featured guest at Cycle Sport Magazine & World Cycling Productions' booth #4777 at the 2007 International Bicycle Expo (Interbike 2007). Liggett, widely known as "the voice of cycling" will be signing autographs and meeting fans Wednesday, September 26 from 10:00 am to noon and from 2:30 pm to 5:00 pm and again on Thursday, September 27 from 10:30 am to noon and from 2:30 pm to 5:00 pm. Both the 4-hour and 12-hour collector's editions of the 2007 Tour de France DVD sets, just pressed, will be available for Interbike 2007 attendees at the World Cycling Productions booth #4777 along with the 2007 Giro d'Italia, many of this year's Classics and perennial favorites featuring America's two top cyclists, Lance Armstrong and Greg LeMond. Free copies of current and past issues of Cycle Sport Magazine will be distributed to Interbike patrons. The online video branch of World Cycling, worldcycling.tv, will be on hand to produce product reviews and merchandise demos for posting on the worldcycling.tv web site. Manufacturers and merchants who would like to have their products featured should contact Adam Reek at (415) 345-9185 or email at areek@cyclesportmag.com or visit him at booth #4777.